Is the new NAFTA the biggest trade deal ever, as Donald Trump said? By Manuela Tobias on Saturday, December 1st, 2018 at 4:16 p.m.
President Donald Trump, Canada's Prime Minister Justin Trudeau and Mexico's President Enrique Pena Nieto, participate in the USMCA signing ceremony at G20 in Buenos Aires, Argentina on Nov. 30, 2018. President Donald Trump sat down with the Canadian and Mexican heads of state to sign the renegotiated North American Free Trade Agreement, or NAFTA, at the G20 summit in Buenos Aires, Argentina, on Nov. 30. And of course, Trump touted the deal — redubbed the United States–Mexico–Canada Agreement, or USMCA — with superlatives. "The USMCA is the largest, most significant, modern and balanced trade agreement in history," Trump said. "All of our countries will benefit greatly. It is probably the largest trade deal ever made, also." Trump’s statement is somewhat subjective, so we won’t place it on the Truth-O-Meter. But we took a closer look at how big and important USMCA really is. If you wanted to argue against Trump — that it wasn’t the largest, most significant or balanced — you would have a lot of evidence to draw on. Experts told us the new NAFTA varies only slightly from the old one, which came into force in 1994. The new deal is expected to take effect around the start of 2020, but still has to be approved by Congress. "Yes, it’s a huge deal, but it’s a huge deal that was negotiated in the 1990s," said Edward Alden, a senior fellow at the Council on Fore­­­ign Relations. "This agreement has some differences, but they’re not that significant." The USMCA touches a variety of economic dimensions. It increases the United States’ reach into Canadian milk and pharmaceutical markets, bolsters labor and environmental rights and broadens protections over intellectual property. Most significantly, it aims to substantially increase the share of car and truck parts made in North America. It includes provisions that are more favorable to the United States than NAFTA, but trade experts told us the process wasn’t exactly equitable. "Normally, there is some sort of balance worked out. That wasn’t the case this time. The United States had a huge list of demands, and Canadians and Mexicans were on the defensive," Alden said. That’s because they feared having NAFTA torn to shreds without a replacement. Among regional trade agreements entered into by the United States, NAFTA is easily the biggest. It accounts for about three-quarters of all the trade volume from the 17 regional free-trade agreements the United States belongs to, according to a report by the Congressional Research Service. "One thing that is absolutely clear is if you measure the new NAFTA relative to what was already covered in NAFTA, the incremental trade covered is very small," said Jacob Kirkegaard, senior fellow at the Peterson Institute for International Economics. In fact, the amount of trade that has been liberalized may actually drop. The rule that requires more North American parts and inputs be used in a car, for example, actually restricts trade, according to Jonathan Doh, an international business professor at Villanova University School of Business. The steel and aluminum tariffs Trump has levied against countries including Mexico and Canada do the same. "The Trump administration’s protectionist measures could easily eliminate more trade than USMCA creates," Kirkegaard said. "So in order to gauge the ultimate effectiveness of this new NAFTA in terms of generating new trade, the Trump administration’s trade policy needs to be factored in." Many of the new rules were actually borrowed from a much larger trade agreement, the Trans-Pacific Partnership, according to Phil Levy, senior fellow at the Chicago Council on Global Affairs. Trump scuttled the agreement soon after taking office in 2017, but it would have included the three NAFTA countries plus nine others: Australia, Brunei, Chile, Japan, Malaysia, New Zealand, Peru, Singapore, and Vietnam. 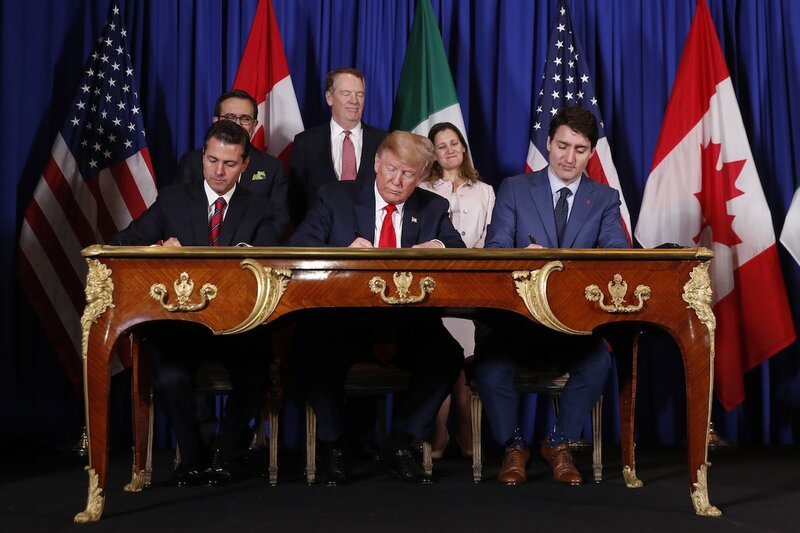 Even though the original TPP never came into force, the deal actually reached the same stages as USMCA. Both were signed by all member countries but not ratified. Still, other trade agreements dwarf the amount of trade created under USMCA, like the 1994 Uruguay Round that kicked off the World Trade Organization in 1995. The Federal Reserve Bank of Boston found initial membership of the WTO "accounted for more than 90 percent of international trade in goods and services." According to World Bank data for 1995, the combination of merchandise exports and services exports totaled $6.5 trillion that year. So 90 percent of that amount would be $5.85 trillion. That’s more than four times as large as the exports and imports for both goods and services between the U.S. and Mexico and the U.S. and Canada for 2017. The $1.2 trillion in trade under the new agreement in 2017 amounted to just 5 percent of the $23.247 trillion in overall world trade that year.